What Goes With French Onion Soup? How To Make A Killer French Onion Soup? “What goes with French onion soup?” This is a question that I always hear from people who are planning to prepare one for the first time. While some of my friends would argue that the soup is a meal in itself, I do realize that many people would still want to pair French onion soup with another dish. 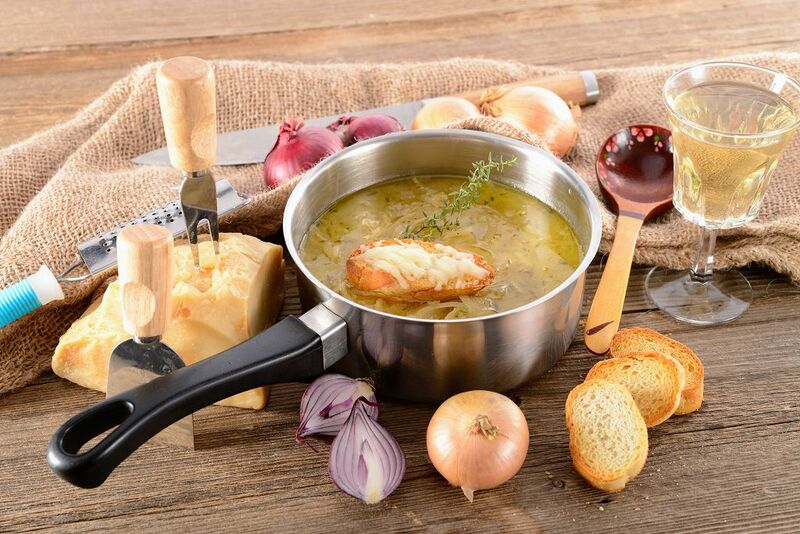 In this article, I will help you think of dishes that go well with French onion soup. What goes with French onion soup? 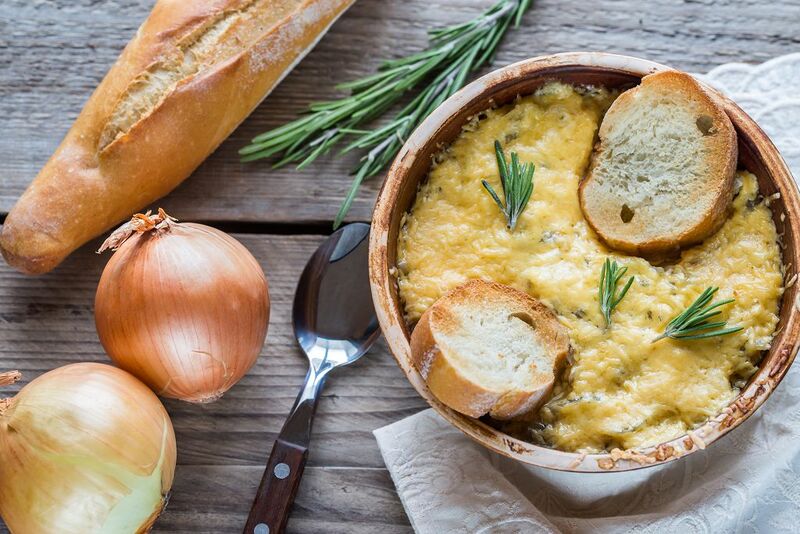 How to make a killer French onion soup? What goes well with French onion soup? French onion soup is a kind of soup made from meat stock and onions. It is usually served with croutons and cheese. It is often served as a starter. However because it is quite filling, it can also be a snack or even a main dish itself. 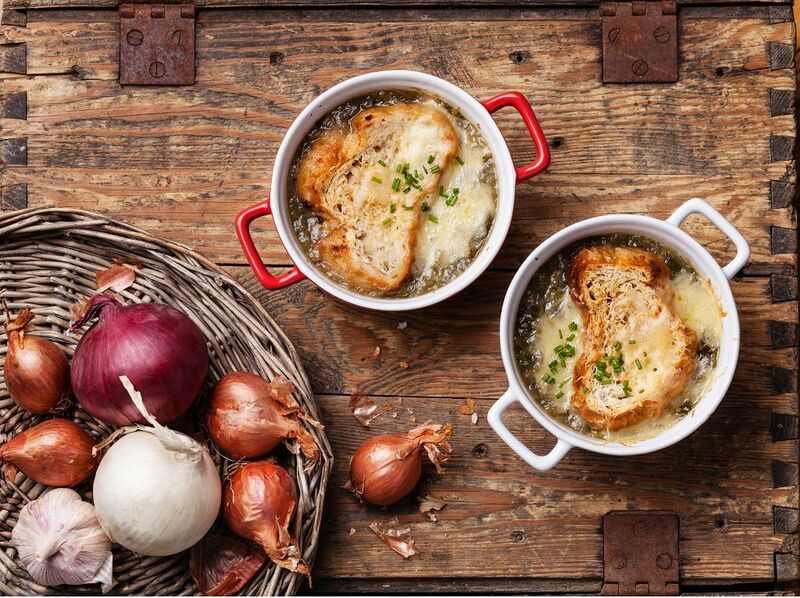 French onion soup became popular in the US sometime in the ‘6os when public interest in French cooking rose. It originated sometime in the 18th century in Paris. But onion soup itself has been around for many centuries. In fact, there are claims that ancient Romans were among the first to prepare it. Onion soup has become very popular throughout history because first, onions were plentiful. It was also very easy to grow. As such, onion soup was often perceived as food for the poor. Salads are one of the best dishes to pair with French onion soup. In fact, I’ve been to some French restaurants and I noticed that a typical French starter course usually consists of French onion soup and another type of salad like a simple Caesar salad or a simple arugula salad. I figured that since French onion soup is strong tasting and very filling; hence it really makes sense to pair it with a lightly flavored salad. You don’t need to spend a lot of time preparing the salad. A tossed salad would be nice as long as you add dairy-based dressing. You can also pair it with a light main course like fish or seafood. You might want to have a giant prawn with beurre blanc for dinner. Or maybe have some lemon and saffron veloute for an authentic French pairing. If you aren’t fond of seafood, green veggies like broccoli or asparagus should be a good complement to French onion soup. Even a handful of boiled potatoes and fresh noodles would work well with French onion soup. Steak is also a good dish to pair with French onion soup. You’ll have a complete meal when you serve French onion soup with a meat course like steak. Then have a slice of toasted French bread and you’ll have a very filling lunch or dinner. Wine also goes well with French onion soup. While it may appear that soup and wine are a bad pairing since these are both liquids, I’ve had a glass of wine while eating French onion soup a couple of time before. Believe me-- a good glass of wine can make the soup even more delectable. Dry white wine should be enough. Red wine is also a good choice especially the fruit red ones. The acidity of the wine will cut nicely against the flavor of the French onion soup. While French onion soup may appear very simple with its combination of onions and broth, I’ve learned that the secret to a delicious soup is this—lots of patience. In caramelizing the onions, you will have to stir the onions frequently. The process is also long—about 45 minutes or so as the onions are cooked on low heat. You will also have to be very attentive as you don’t want to burn or overcook the onions. Another secret in cooking French onion soup is using the right pot. I recommend that you use a large and heavy pot like this. And please, don’t even use a non-stick pan in cooking French onion soup because these won’t caramelize. Let's say that you want to make a double batch. I suggest you caramelize the onions in two pots and once they're done, combine them in one pot. Then add the stock. I usually add ​sanding sugar to the onions to hasten the caramelization process. Add a pinch of sugar about 10 minutes after you started the caramelization process. Use a wooden spoon to scrape up the onion bits should these stick to the bottom of the pot. In my experience, the time it takes to caramelize the onions would also depend on other factors like the gauge of the pot and age of the onion. You would know that onions are done when you taste them. They should taste sweet. 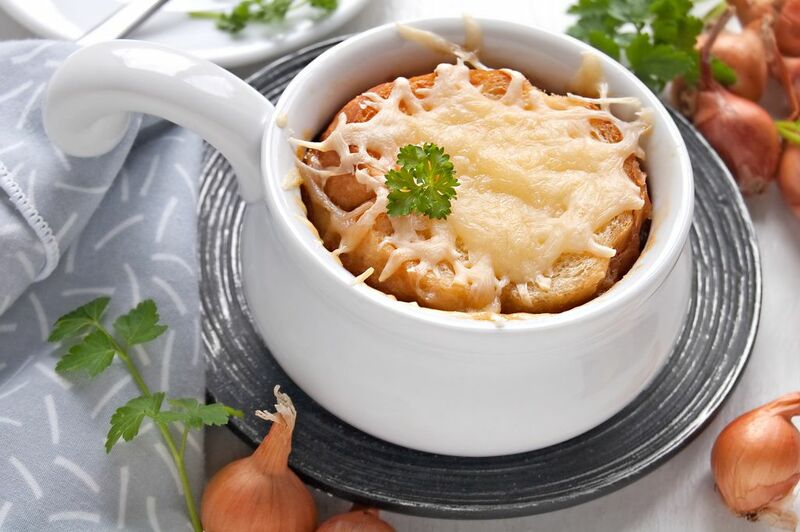 French onion soup is good enough to be paired with meat, fish and vegetable dishes. You can also enjoy it with salads and wine. Did you learn anything from this article? Share it with your friends so they too would know what to serve with French onion soup.